Finding pearls. Fire forces 4-story jump and a woman embraces beauty. An arsonist set fire to Alina Miller's apartment building. She escaped, but shattered her leg. Then she embarked on a remarkable journey. A big ball of orange lit up the window of Alina’s fourth-floor apartment. Alina Miller had to jump four stories out of her burning apartment building. Now, she’s embracing every adventure that comes her way. She wondered for just a second why anyone would be setting off fireworks a month after the Fourth of July. That thought vanished quickly as she realized that her building in Aurora was ablaze. She had to escape. Alina, then 22, raced to open the door leading to a long hallway, only to be pushed back by a wall of flames and thick, acrid black smoke. She ran to the window and screamed for help. No one was there. Adrenaline raced through her body. Could she try jumping to a third-floor ledge? That wouldn’t work. Could she lower herself to the third floor with a sheet? No, she didn’t have enough upper body strength. There was no sign of firefighters yet, and in the 30 seconds since she had first noticed the flames, her apartment was filling with smoke. She took the only escape she could. Since that horrific day in August 2012, Alina got married, walking down the aisle in tiffany-blue Converse tennis shoes to wed her wonderful Jeff. She has nurtured a swarm of bees that produce gobs of honey, encouraged others in her work and inked a new tattoo on her upper right thigh – oysters. For Alina, oysters are near perfect specimens. They’re filter feeders, leaving their environment better than they found it. When an irritant such as a fragment of shell becomes lodged inside an oyster, a pearl forms. Alina Miller has been more active than ever after a fire forced her to jump from her 4th-story apartment building. She shattered her leg, but found a rich new life. The arsonist, influenced by Aurora theater shooter James Holmes, had a full container of gasoline when he started pouring it in the hallway outside Alina’s apartment, making the fire more intense on the upper floors. When she jumped, Alina’s barefoot left foot hit first and took the brunt of the 45-foot fall. Her weight shifted to the right foot, and then she fell straight back, landing hard on concrete which broke her back. Her cell phone flew somewhere near the building. A man raced to her side, and then he told her he had to go check on others who were hanging out of their windows. A woman ran to Alina’s side to help. “My feet are broken. I can’t move,’’ Alina told the stranger. Alina Miller waking up after her amputation. Photo courtesy of Alina Miller. Somehow, the stranger-turned-guardian-angel managed to pick up Alina, leaning against a minivan for leverage before carrying her to the far parking lot. Another man came to her and asked if he could help, then he retrieved Alina’s cell phone that had bounced out of her pocket in the fall. She called her mother, a nurse at Denver Health. All around, fire exploded from the windows of the apartment building, firefighters scrambled to rescue people and the shrill of sirens filled the air. “We were watching the windows and seeing the chaos. We couldn’t even function,’’ Alina said. An ambulance whisked Alina to nearby UCHealth University of Colorado Hospital on the Anschutz Medical Campus. She was assessed and immediately taken to surgery. Both feet were shattered; she had a compression fracture in her back. Dr. Bennie Lindeque, an orthopedic surgeon, saw Alina in the ER and Dr. Robert Leland, an orthopedic foot and ankle surgeon, then assumed responsibility for her care. “Dr. Leland said my left foot was like trying to put back together a (crushed) potato chip,’’ Alina said. Alina stayed in the hospital for five days, never alone for more than an hour with a constant stream of visitors and loved ones. She had casts on both her feet and a back brace that stretched from hips to collar bone. She then was able to go to her mother’s home. A nurse at Denver Health for 30 years, Kellie Leigh, carefully tended to her daughter. Alina Miller works to get out of her wheel chair. Photo courtesy of Alina Miller. As she recovered, Alina made frequent visits to see Leland, who tried to help with the severe fractures to her calcaneal – or heel – bones and the associated damage to surrounding tissue and joints. She spent months in a cast and boot suffering deep pain that hurt her all the time. 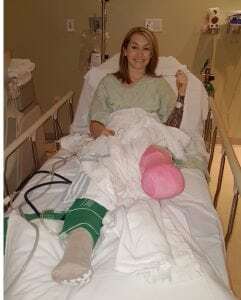 “It’s not so much getting the bone healed, the problem is when you have a real high energy break, the soft tissue and everything around it is also severely injured,’’ Leland said. Alina had a strong support system to help her push through the darkness. Her mom and friends got her out on the porch to sit in the sun and pushed her around the park in her wheelchair. Even little trips to the mall and Ikea were exhausting, but they kept Alina from becoming depressed. Seven months after the fire, Alina became reacquainted with Jeff Miller, whom she knew in high school. In the months and years after the fire, Alina had five more surgeries to repair her shattered foot. A slender woman to start with, Alina shrunk to only 87 pounds. She acquired an infection after one of the surgeries and needed a PICC line – a peripherally inserted central catheter – for three months so she could receive medications intravenously. With each surgery, scar tissue formed and her foot gradually became more and more nerve sensitive. She spent much of her time on crutches and in a fracture boot. Jeff became Alina’s everything. He took her to and from appointments and physical therapy, sleeping on the couch in the hospital when she had overnight stays. He cooked exotic meals in attempts to help Alina gain some weight back and would stay up late into the night holding her while she cried from the pain. A man who never before had been comfortable in a medical environment became fluent in the language and her care. In October 2014, Jeff planned a day of surprises. He took Alina, who loves insects and once raised tarantulas and praying mantises, to breakfast and the Butterfly Pavilion. Then he dropped her off for a massage, took her home to take a nap. (She required naps when her foot was bad because walking was so exhausting.) Then they headed to the Denver Botanic Gardens. Alina was seated in front of a lake when Jeff’s best friend, a photographer, popped out of nowhere. Alina turned around to find Jeff on one knee. Alina decided she would have an eighth surgery so she could walk down the aisle at her wedding, eight months away. Wearing blue Converse shoes and she and Jeff said their vows Sept. 5, 2015, in the Tears McFarlane House near Cheeseman Park in Denver in a beautiful ceremony followed by a reception, but no dancing. The wedding was storybook-perfect. And soon it would be time for Alina to continue with her plan. 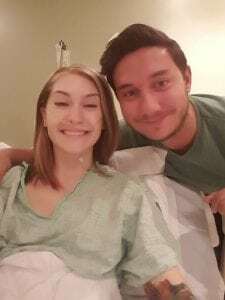 Before the wedding, she and Jeff decided that after their wedding and honeymoon, Alina would have her left leg amputated below the knee. 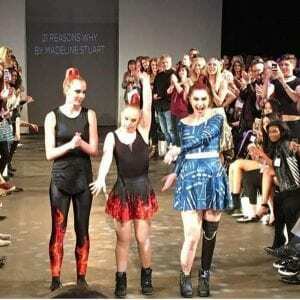 Alina Miller gets a chance to model with Madeline Stuart, the first professional model with down syndrome. Photo courtesy of Alina Miller. By the time January 2016 came, Alina was ready to say goodbye to her leg. Initially, the idea of leg amputation was traumatic, though Alina came to accept that surgery would allow her to be pain-free, and certainly less tethered to doctors and hospitals. Before the surgery, Alina’s mother wrote a note in magic marker on her daughter’s left leg. Leland, who shared Alina’s highs and lows during countless appointments, is one of the most important people in Alina’s life. Every Christmas, she makes it her mission to deliver a gift to him. Four years after she jumped from the burning building, surgeons at University of Colorado Hospital amputated her left leg, below the knee. And Alina had no regrets. A new leg. A new life. “I woke up happy,’’ she said. A few months later, she was fitted with a prosthetic left leg. The new leg gave Alina a new life. She joined Denver LIM359, an adaptive, ability-based group that provides therapy through activities for people who have lost limbs. With that group – and a prosthetic leg – she has done wakeboarding, scuba diving, archery, rock climbing. Alina and her husband as she headed into her amputation surgery. Photo courtesy of Alina Miller. 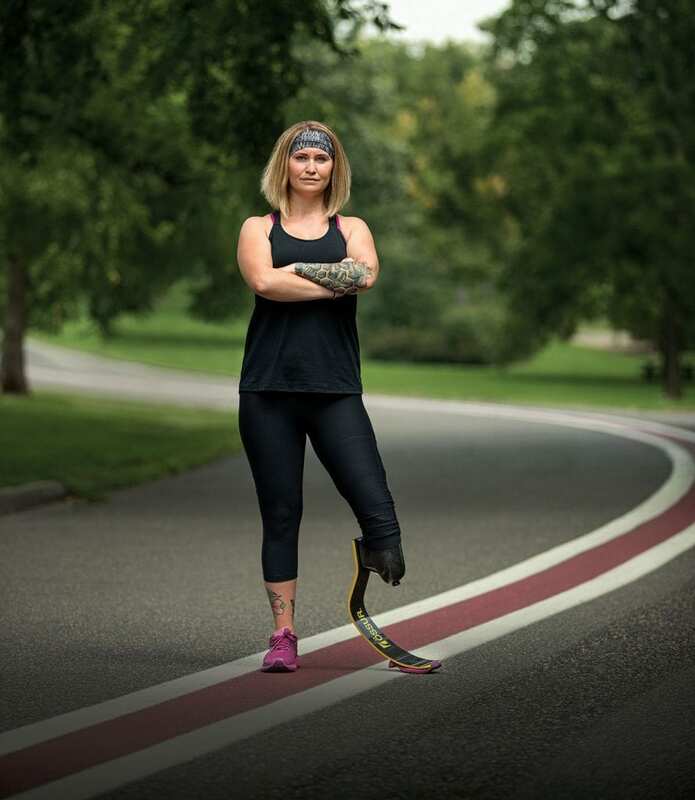 She recently received a prosthetic “blade,’’ which has allowed her to run many events throughout Colorado, including the Colfax 5K. She recently participated in a camp teaching new amputees how to run, swim and bike. Through Denver LIM359, Alina has become more curious, adventurous and willing to cherish and relish every moment. “It’s just like trying to hit a bucket list – say no to nothing,’’ she said. In November, Alina plans to try sled hockey, propelling herself over the ice with her arms. At home, she and Jeff spoil their dachshunds, FlapJack and Olli. For Christmas, her friends will receive a jar of honey from her hive of bees. Alina works at Creative Technology Orthotic & Prosthetic Solutions, where she and another man who has also lost a leg spend time helping people who have lost limbs. They meet regularly with new patients in the first six to eight weeks after amputation. When Leland has a patient who is considering amputation, he asks Alina to come to talk to the person and offer support. 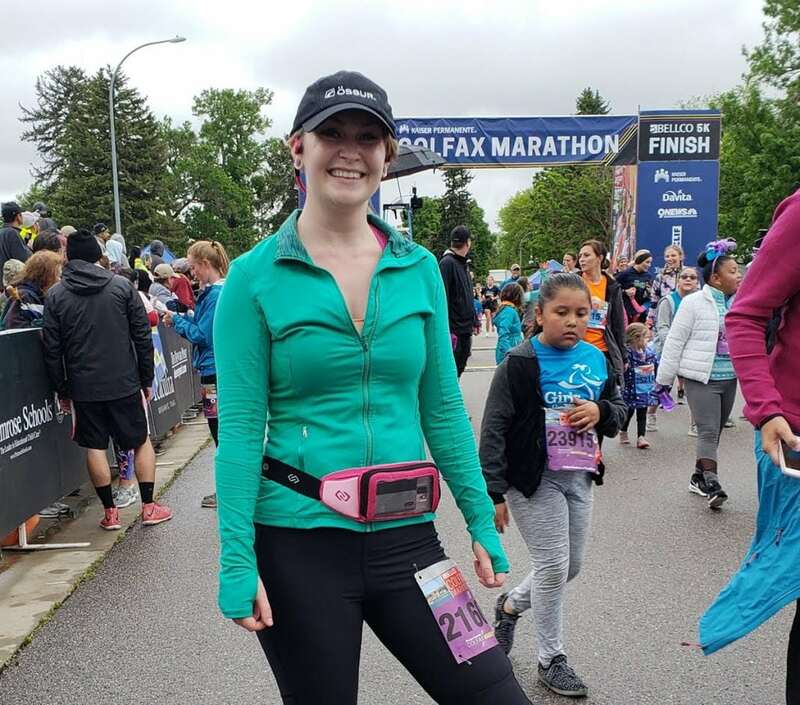 “We go to doctors’ appointments with them to make sure we are all on the same page about the patient’s care, and we provide full support for them and for families, to help them understand,’’ Alina said. After conversations with those who have lost a leg, Alina finds she is grateful that her amputation came over time and not immediately. After all those years of surgeries and struggling with a bum leg, it was something she had prepared for and wanted. The one thing she can’t do is stand on her tiptoes. “It annoys me, but it’s pretty minor,’’ she said. On Aug. 7, the day after the sixth anniversary of the fire, an artist inked the tattoo of oysters on Alina’s upper right leg, a reminder that irritants can turn to pearls.